Rabies in Angora goats is extremely rare but it is possible that they can, in the same way as humans, become accidentally infected. There are two main cycles of Rabies in South Africa. The Mongoose strains of rabies virus- well adapted to other mongoose species, especially the yellow and slender mongoose, and suricate. This virus type spreads readily within and between these species. The Canine strain of rabies virus- has become well adapted to dogs, jackals and bat-eared foxes and the virus spreads readily within and between these species. Other animals (Angora goats) and humans can become accidentally infected by either of these two cycles through saliva usually involving a bite. Rabies infection is fatal in all species and no species has a carrier state where virus is shed in the absence of clinical signs or imminent clinical signs. If rabies is suspected in any animal do not handle. Contact your State Vet or Local Vet for advice. The suspected animal will need to be killed and a brain sample taken for diagnosis. Rabies virus gains entry into a new host by introduction of virus-containing saliva into a bite wound. Entry may also be gained by saliva contamination of the mucous membranes of the mouth, eyes and nasal passages. Livestock are often exposed when they investigate this new animal in their surroundings. Because people can be exposed to rabies by contact with wild or domestic animals, avoid "suspicious" animals. It is vital that all farm cats and dogs are routinely vaccinated to reduce the risk of humans contracting rabies. 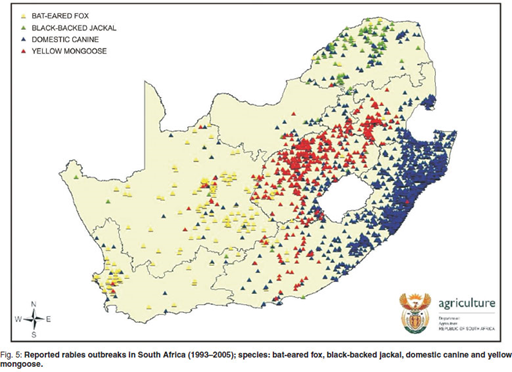 Clinical signs reported in confirmed rabies cases in goats from September 1987 to December 1999. Cases of rabies in sheep appear more similar to rabies in cattle with an average incubation period of ten days. Dogs: Change in temperament, attacking and biting anything (often injuring mouth and breaking teeth), exaggerated responses to sound and light, restlessness, nervousness, snapping at imaginary flying insects, disorientation, wandering aimlessly, a fixed stare, drooling saliva, hoarse howling, choking sounds, “bone in throat” syndrome, a febrile reaction, uncoordinated actions and progressive paralysis, dilated pupils, irritability, photophobia, infliction of self-injury, convulsions, and muscle spasms. Cats: Generally aggressive, uncoordinated, frothing, muscular tremors, dilated pupils, staring, a threatening posture, abnormal vocalisation, lack of response to owners, unprovoked attacks, biting (sometimes without releasing grip), convulsions, paralysis, coma, hiding away, some cats appear unusually affectionate and purr, or extend and retract their claws. swaying gait, tail and posterior limb paralysis, jaw and tongue paralysis, profuse salivation, dragging hooves, pseudo-oestrous, hypersexual behaviour, decreased milk production, dilated pupils, fixed stare, grinding teeth, pica, tenesmus with diarrhoea, frequent urination, loss of condition, and emphysema. Sheep: Symptoms resemble those of cattle but hypersexual behaviour, sexual excitement, incessant bleating, salivation, aggression, aimless running, pawing and paddling, and grinding of teeth are prominent. Horses: Febrile reactions, altered behaviour, biting of wound site, aggression, thrashing, paralysis, and inability to swallow. Pigs: Hide in corners of pen, hypersexual behaviour, aggression, biting, and may kill offspring. Wild animals: Often lose fear of humans.